This wonderful fall salad combines peppery arugula and sweet, juicy pears. Spiralizing the pears instead of simply slicing makes for a beautiful presentation, and also creates crisp-tender texture in the fruit allowing it to take center stage. Crumbled blue cheese, toasted walnuts, and dried cherries add flavor, sweetness, and crunch. The whole dish is together with a simple, tangy maple-Dijon vinaigrette. Serve this sweet and savory salad as an impressive first course at your next dinner party, or as a side dish with roast chicken or pork tenderloin. Be sure to choose firm pears, preferably Bosc or Anjou, when preparing this salad. They're easier to spiralize than pears that are very ripe. You could also try firm, tart apples such as Granny Smith or Honeycrisp in place of the pears for a crisper flavor. Per Serving: 254 calories; 13g fat; 31.6g carbohydrates; 5g protein; 13mg cholesterol; 409mg sodium. I'm trying to eat better, and sometimes salads are just boring. However, this pear and arugula salad is really good. I usually have this with chicken and take for work. Easy and simple. 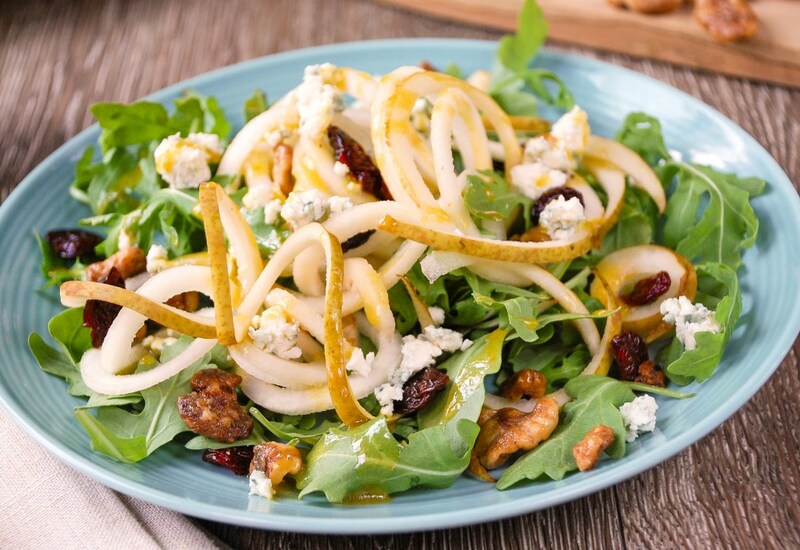 This is definitely not a boring salad, and the idea to spiralize a pear is so cool! I just got me Mealthy Spiralizer and am obsessed with the blade settings. This was exactly the right thickness for the pears. This is a great salad for fall, love gorgonzola with dried cherrie and walnuts. I just toasted mine in the broiler for a few minutes to get that flavor out of them.